Submitted by Fred on Sun, 09/16/2018 - 8:28am. Submitted by Fred on Thu, 05/17/2018 - 6:06pm. Submitted by Fred on Fri, 05/11/2018 - 1:35pm. 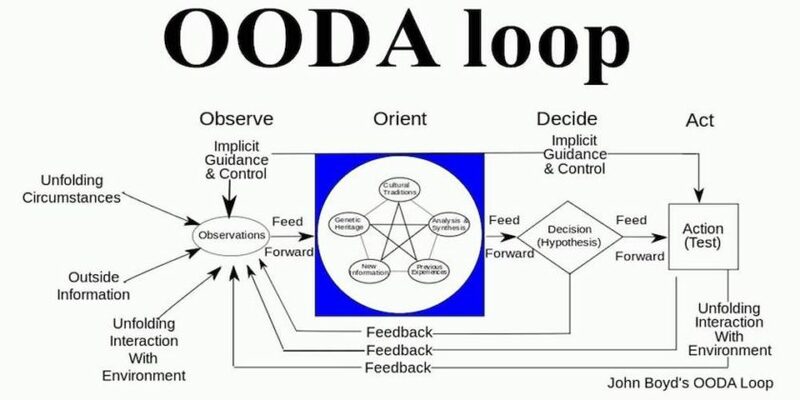 In Part 2 of this video series Boyd continues with his idea, what he calls a "New Conception" of fast transients O-O-D-A Loops that lead to outmaneuvering an adversary. The idea of fast transients suggests that, in order to win, we should operate at a faster tempo or rhythm than our adversaries—or, better yet, get inside adversary’s observation-orientation-decision-action time cycle or loop. Submitted by Fred on Sat, 05/05/2018 - 9:49am.